Learning to sail is easy, and you can have a lot of fun in the process. We asked Rich Jepsen, the owner of the Olympic Circle Sailing Club in Berkeley, CA and Chair of US Sailing’s Training Committee, for some tips on choosing a sailing school. How long does it take to learn how to sail? It varies with the individual. The general rule of thumb is three to five days. What questions should I ask a sailing school to determine if it’s right for me? What is the ratio of classroom to practical training time? How does the school deal with remedial training for those who need a bit more training? How many staff members are responsible for boat maintenance? What is the minimum number of students that must be present for a course to run? I want to own a boat with a steering wheel. Can I learn to sail in a boat with a wheel, or should I start in a small boat with a tiller? You should start in a small, tiller-steered sailboat. You can learn on either a dinghy (centerboard) or a keelboat (weighted keel for stability) and work your way up. Small, tiller-steered boats give you the opportunity to understand how the boat really operates while under sail and develop a proper feel for the interaction between boat, sail, wind and water. That is impossible in a larger, wheel-steered boat, because the size of the boat and the mechanical advantage in the wheel steering rob you of feel. A wheel-steered boat is easy to learn once you have developed real sailing skills, which are easily transferable to different sizes and types of boats. Does a boat with a tiller steer differently than one with a wheel, and what are the advantages and disadvantages of each? The only reason to have a wheel on a sailboat is when the boat is big enough to create a need for mechanical advantage greater than that of a tiller. That’s why you seldom see a boat under 30 feet with a wheel. So, the advantage of a wheel is it makes it possible to steer a larger boat in strong winds. However, what you gain in mechanical advantage you lose in feel. This is no problem for an experienced sailor, but makes it quite difficult to develop intuitive sailing skills for a new sailor. It can be done, but it takes much, much longer to develop pure sailing skills. Smaller keelboats with tillers are more responsive and the feedback from the boat and the tiller are immediate and obvious – two important aspects of learning any new sport. What is an “accredited” sailing school? 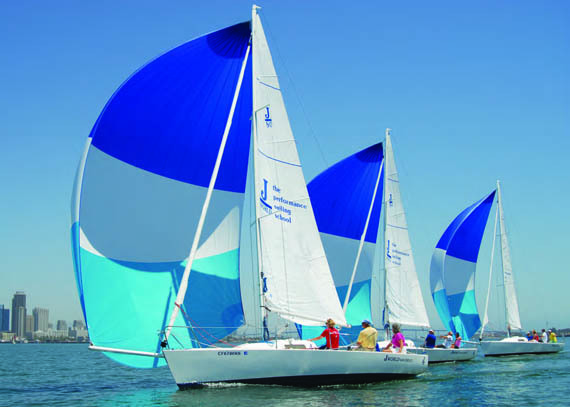 A US Sailing accredited school must meet a high level of criteria to be accepted into the system. Their facilities and curriculum must be of the highest quality, they must have US Sailing certified instructors on staff, and they must have insurance that protects both their employees and students while on their boats. How many people are in a typical sailing class? The optimal level is probably three, but most schools sail with four to keep the tuition lower. However, there are debilitating effects on training when there are more than four. Because of the way people learn, they need to remain involved for a reasonable period of time. With five or six students, each student gets so little time at the helm and attention from the instructor that it interferes with the speed of learning as well as with the student’s level of engagement and focus. Is it better to take private lessons?Private lessons are fine. What you don’t get with private lessons is the bonding and new friends you make while you are all learning and experiencing things for the first time. I want my wife and kids (ages 9 and 12) to take lessons, too. Do some schools offer “family packages,” or is it better for kids to learn on their own? Learning as a family can be a great thing. 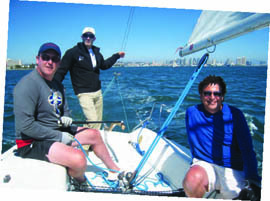 Most learn to sail programs aimed at adults will work well for kids as young as 9, although it really depends on the kid. Kids 12 and above can do well even if they are ‘along for the ride.’ However, younger kids should be sufficiently excited by the prospect to stay focused enough of the time to learn well in an adult-focused course. And, contrary to popular belief, couples can learn well together if they are equal partners in other activities. I’m worried about crashing into the dock or another boat. How will the instructor handle that? 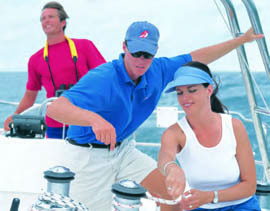 Your US Sailing certified instructor is of the highest caliber. Before he or she is issued instructor certification, he or she undergoes an intense three-day course to ensure he or she can handle all situations while under sail with a student. US Sailing instructors are there to help you learn, and to help you feel free to make mistakes and be safe while at the tiller. If you are learning at a US Sailing school, the odds are astronomically low that you’ll experience such a problem while you learn! What should I bring to sailing class?The sailing school will let you know what to bring, as it varies by location and weather conditions. We eventually want to go cruising. Do sailing schools teach subjects like navigation, what to do in rough weather, and how to use an anchor? Actually, you learn these skills at the basic keelboat level. As your sailing skills advance, so does the progression of instruction in navigation, anchoring and rough weather sailing. Once we’ve mastered the basics, do some schools rent boats with a captain who can “show us the ropes” until we’re ready to take a boat out on our own? All schools will be happy to provide you with a captain while you gain enough confidence to go out on your own. However, consider that you are being trained to be confident as well as competent. If you are at a good school, they will ensure you are both before certifying you. At that time, you’ll be eager to be out on your own, either on one of their rented boats or your own, if you are so inclined. We’d like to own a 40-footer, and I’ve heard that we can reduce the cost of buying a new boat by “putting it into charter.” How does that work, and what are the advantages and disadvantages? This also varies from area to area in the US. Some programs pay you a monthly fee for unlimited access to your boat with a specific number of days you can use your own boat. Others pay you a larger ‘per use’ fee and allow you unlimited use of your own boat. Some reduce the charter fees but cover the insurance and berthing. Others pay a higher fee but require that you maintain those expenses yourself. 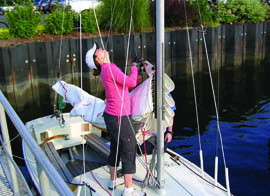 Advantages are: Your boat gets professional care from day one, with no maintenance learning curve that you would have as a new boat owner; your boat earns money when you aren’t using it; you are integrated into the social network of the school, club or charter company, so you develop well trained crew and friends to make your sails that much more enjoyable. Disadvantages are: If you are in a successful program, your boat will experience more wear and tear, as it is being used more often than you would use a boat yourself. You will need to make advanced reservations for your boat most times, although there will be plenty of down time where you can take your boat out on the spur of the moment. The most important things to consider are the reputation of the program for training and certification, its client base size and the condition of the boats already in charter. A friend, who is an experienced sailor, said we should also consider “fractional sailing.” What are its advantages and disadvantages? Fractional Sailing is about the same per use financial value as charter management or leaseback (described above). Its advantage is that you are sharing the boat with a specific, smaller group of people. If the fractional use has all of the maintenance and turnaround done professionally, you always get on a boat ready to go. Its disadvantages are that you usually undergo sort of a “draft” of sailing days with the other members of the fractional use. The most popular days will disappear quickly. If you are in a fractional use program where the members care for the boats, there are potentials for disputes in level of care, expense to be shared on replacement of worn gear, etc.